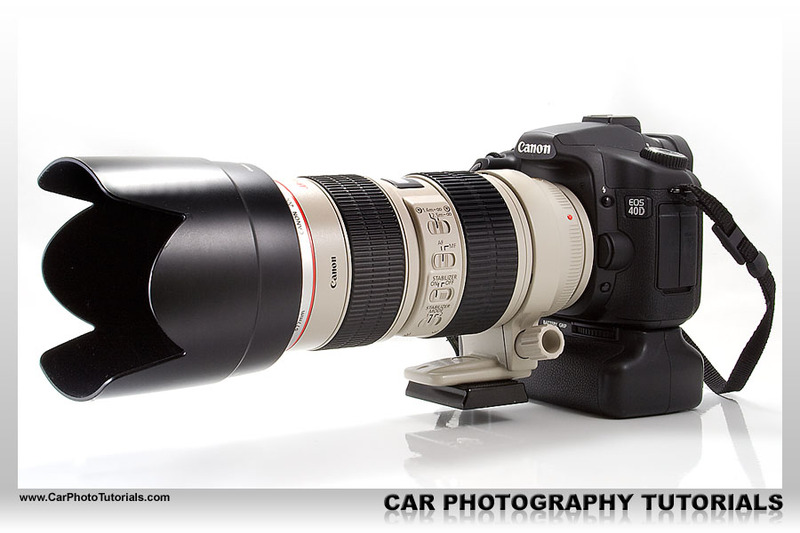 So you are looking into photographing cars ? What kind of equipment do you actually need to get started in this really interesting niche of photography ? First of all you'll need a camera, and here the problem already starts : how much cash are you willing to spend on this new hobby, do you intend to take things serious from the start to make money out of it in the long run? Or do you just want to take nice shots for your personal album ? The answer to the question above will determine the amount of money you’ll end up spending on this, if you intend to have some fun with your hobby and take photographs of cars you see during events or shooting your friend’s car you won’t need the top of the line DSLR costing thousands of dollars, you can start with an entry level DSLR or even a decent bridge camera. If you’ve never taken photographs of cars on a serious level I would suggest you don’t blow all your savings on buying a high end camera and expensive lenses just yet, start out with a decent entry level model and some well known basic glass in front of it, I would advice to go to a DSLR from the start so you can grow into it by getting better lenses afterwards. Remember that your lenses will outlive the camera several times over, you’ll be replacing a DSLR body every two or three years, while your lenses can easily reach ten years or more if you take care of them. But first things first : set a budget for this, how much can you spend on this new hobby without having to cut into your household money, remember you can’t eat a camera, so don’t put yourself into financial troubles to buy a camera or other photographic option, it’s not worth it … you will not be making lots of money with your photographs from day one, it takes time and practice. Once you’ve decided on a budget you should start looking around on various internet sources that test digital cameras, at this day and age there are thousands of sites available to guide you in your choice, but only a handful are really useful I think. Where should you look around ? For instance the DPReview.com site is a really large source of independent digital camera testing, both for small compact units right up to the high end DSLR segment, they are all there, and there is also a nice forum that is constantly buzzing with information of real time users. Another site I check out regularly when deciding to buy something new is PhotoZone.de (don’t worry, it’s in English), Klaus has a nice, down to earth way of testing equipment, and his ‘verdict’ is always interesting and most of the time spot on. My third option, especially if I'm looking into buying a new lens, is FredMiranda.com, in particular the 'Reviews' section. Here actual owners talk about how they feel about a specific lens. You can find some conflicting options here but it is nice to read about their opinion anyway, also the Forum is very active, however not much car photography gets listed. What kind of equipment do you really need ? As I mentioned above, I would go for a DSLR right from the start, this way you can put the lens on it that you really need, and you won’t be blocked by a fixed lens on a compact or bridge camera. Do note that a compact will most likely never be able to offer you the flexibility of a real DSRL, and I don’t mean lenses alone here, the high ISO quality of most compacts leaves much to be desired. More importantly the shutter lag on compacts can really ruin your day when you want to shoot action around the track. If your prime intention is to have some snapshots of cars you encounter on the road or during small time events, then by all means go for a decent compact unit, something like the Canon G-series or similar, these are small enough to fit in your pocket and achieve relatively decent results anyway. 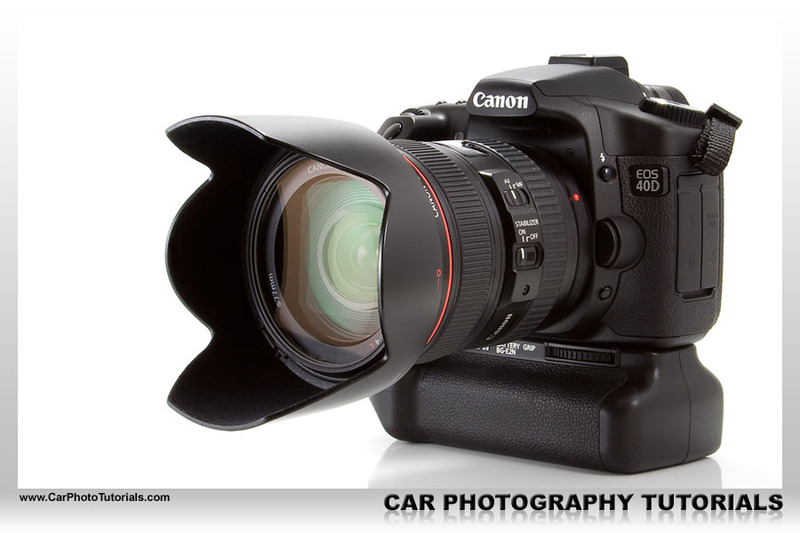 If you are serious about photographing cars, and don’t want your camera to be the blocking factor to your performance, you’ll need a DSLR, there is no other way. So my advice is to go for a nice entry level camera to start with, don’t buy a top of the range model just yet, it will overwhelm you and could put a stop to your photographing experience before you get started. Which camera to get ? My advice : go to your local photo equipment store and grab the different cameras they have in stock, just get an overall feel of the body with a lens installed (I will discuss your lens later on in this article) so you can feel how heavy, or light the combination is. Also try to reach most of the button on the top and rear of the camera, it should all work nicely without you flexing your fingers in awkward angles. Do keep in mind the budget you’ve determined earlier, no need to ‘feel’ a 5000 USD unit at this point, stick to the base models, they have all you need to get started anyway. 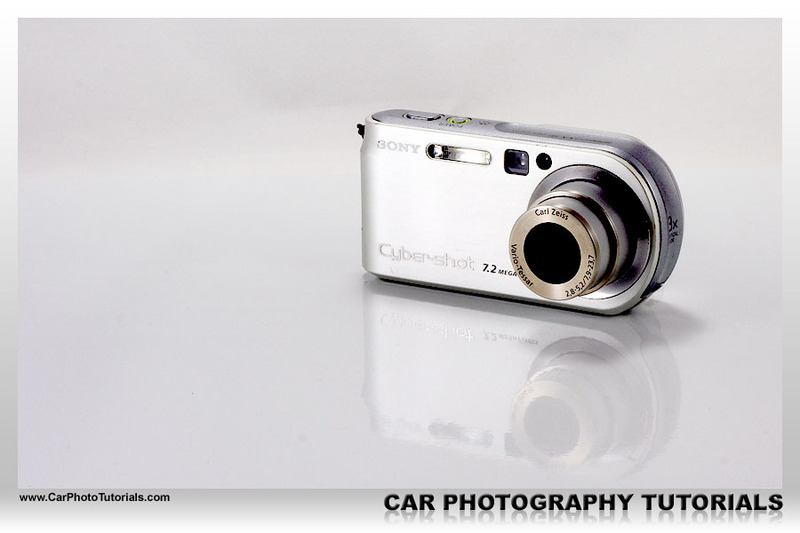 At this moment there are no bad cameras anymore, Nikon, Canon, Sony, Sigma … they all make decent entry level bodies that allow you to set your first steps in photographing cars. I’ve started out with a Canon 350D (the Digital Rebel XT) back in 2005 after I outgrew my Canon PowerShot G6 unit, I’ve taken several award winning photographs with this basic model, you just have to get to know the limitations of the body/lens combination and you’ll be able to take outstanding photographs with just about any camera. 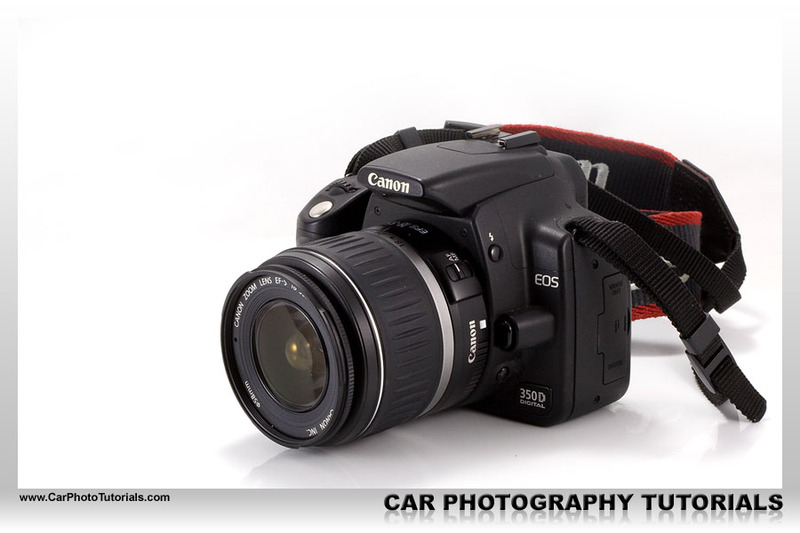 These days I would go for the Canon 450D (EOS Digital Rebel XSi) to get started, or its counterpart from Nikon, the D60, it just depends on how it ‘fits’ your hands and what kind of feeling you get when you hold it, prices are similar between all these basic models. Personally I would stick to one of these bigger names, I know that Sony, Sigma, Olympus, Pentax and a lot of other makes have perfectly nice entry level DSLR in their line up today, but call me old-fashioned … I would stay with either Canon or Nikon. Ask around in your family or perhaps even among your friends, chances are they have some old lenses around from ‘the good old days’, with a bit of luck these still work on today’s digital cameras, so you can start with those. Just in case you can get a free lens this way, it will also narrow down your choice of cameras, if your friend has a Canon lens he is willing to part with you don’t even have to look at a Nikon camera in the shop, you are somewhat forced to go for a Canon body. Most of the time these older lenses are not the best option to get you started, if they are really old they don’t allow auto focus, in case of Canon you will need an EF lens and not the older FD units, they don’t fit the current line of cameras anymore, so I would still advice you to get at least one standard, new lens. Most cameras these days are sold in kit, this means that they come complete with one lens to cover the basic range you might need. Most of the time these are not the best possible lenses available, but they will get you started on a budget. In the good old film days a standard lens would be a 50mm unit, but these days most DSLR have a crop factor, on the Canon 450D this is 1.6 for instance, so putting a 50mm lens on that body will actually give you an 80mm view, both of which are not really useful when photographing cars. 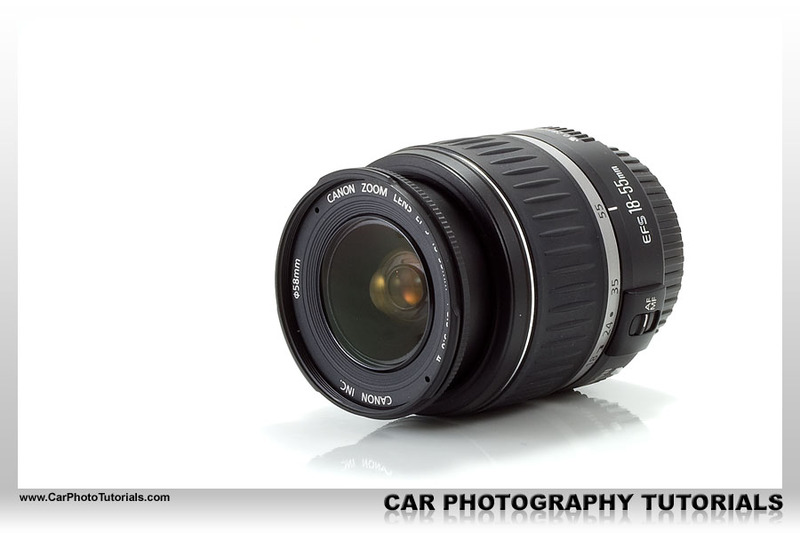 The basic kit lens usually starts at 17 or 18mm, which is near perfect for car photography, and it runs up to 55mm or more. The latter you probably won’t be using a lot around cars, but it can help if you want to get a nice detail on the car. I would however think twice about getting one of those 18-200mm super zooms, their quality is not really very high when it comes to capturing details on a car, they do work perfectly as a walk around lens however, avoiding the need to change lenses while on vacation. 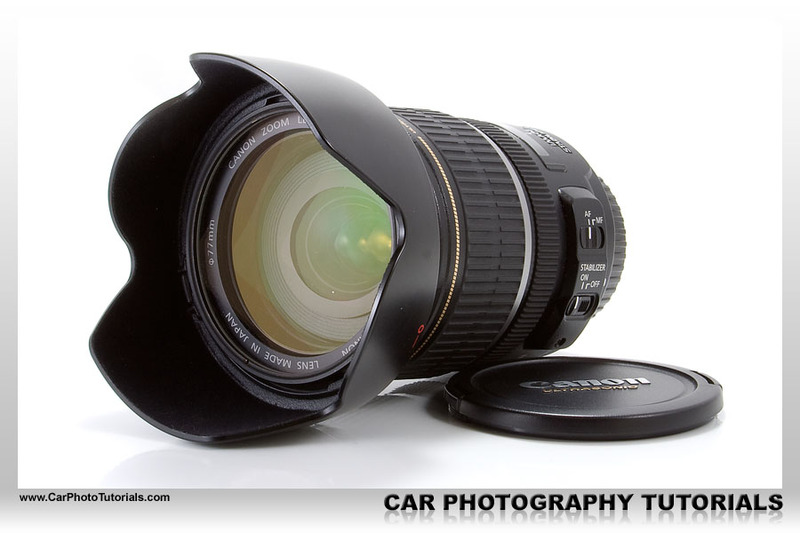 You need a basic lens, something like 17 to 55 mm, preferably with some kind of stabilization like the Canon EF-S17-55mm f/2.8 IS USM lens, a near perfect lens for photographing cars (I’ll talk about what all those characters mean later on), the only problem is that this lens will cost more than your DSLR, so perhaps we should look for something less expensive. If you look into some track time you will also need a longer lens, something like a 70 to 200mm preferably even longer, but that's a totally different ball game, so we'll discuss those lenses later on, for now focus on getting your basic kit together. And that’s it ! 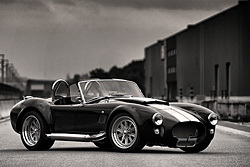 You’re all set to go out and start gathering experience in car photography, you’re on your way to get your photograph on the cover of a magazine. This would set you back about US $ 800 in total and offer you a complete set to gain the necessary experience that will allow you to select the lenses you actually need in the future, as you will be expanding I can assure you. Just as a side note, there are literally dozens of good entry level cameras out there, just because I mention a Canon system doesn’t mean you can’t buy other makes, I’m sure that Nikon, Pentax, Sigma, Sony and all the other makes out there make equally good DSLR bodies to start with, but my experience has been with Canon for over 15 years now, so that’s what I know best. Another important thing to consider : do not buy a semi-pro body and put an entry level lens on it, this will degrade your shots, a much better option when you are on a tight budget is to get an entry level DSLR and put a high end lens on it, as I've mentioned before you will be keeping that lens a lot longer than your camera body. When deciding on which camera / lens combination you want to buy you should visit a store that has them in stock so you can actually ‘feel’ the body on your hands, preferably even with a lens on it. This way you can judge if it feels right in your hands, not too heavy, not too flimsy, easy to use the buttons scattered all around these cameras today, that is what’s important. In the end they all allow you to take award winning photographs, but what really matters is how you can handle the camera, you have to feel comfortable with it so it doesn’t hinder your creativity. 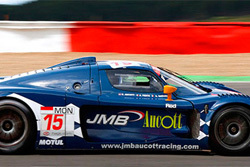 Now get out there with your new camera and shoot some cars ... 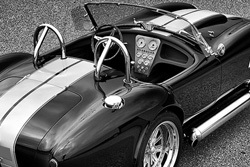 When you feel comfortable with your equipment you can continue with our tutorials that handle photo manipulation and expanding your car photography gear. If you would like to print the 'Must have base equipment' article you can download our special PDF which is optimized for hardcopy layout.